Sayers Journey: Overnight, I swear! Seriously, from one day to the next I don't notice much belly growth, but I go to bed on Sunday feeling pregnant but normal, and I awake on Mondays with a huge belly! Each Monday marks a new week for the pregnancy and I do belly photos, so maybe that's why I notice it... but seriously, today I feel twice the size I was yesterday! My slight penguin walk is a full blown waddle. Emptying the grocery cart at the register left me breathless. And my maternity pants won't stay up and the shirt won't stay down. Pregnancy is amazing! 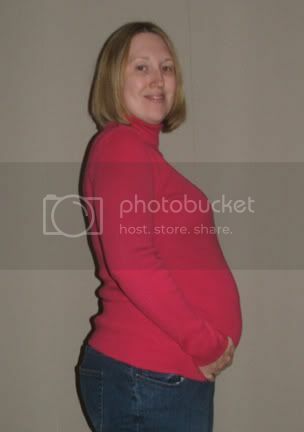 These are not complaints people, this is pure wonder of a woman's body carrying a child! And I must brag, all without stretch marks! My point of view... yup, feet are gone! I got artistic... basically since my belly is so pale anyway I had to do something with it in Photoshop, so yeah, that's my belly and not the moon! And last is for comparison... Notice the pink shirt, or better yet, the length of the pink shirt and where it falls on the belly... it's the same one I'm wearing in the week 24 shot, 24 weeks is first, 26 weeks is last... tell me that's not a lot of growth! I love these shots! Especially the one that shows us your point of view and the fact that your feet have disappeared. Love that! You look so great. I know I tell you that every week but I truly mean it and I am just so completely happy for you both. wow your belly is soo wonderful!!! and yay no stretch marks!